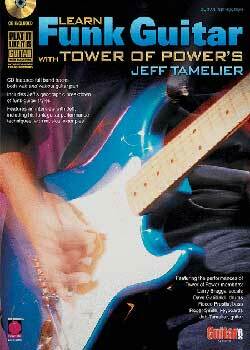 Learn Funk Guitar with Tower Of Power’s Jeff Tamelier PDF + Mp3 CD download. Features an interview with Jeff, including his funk guitar performance techniques, with musical examples. Not only will you learn classic funk guitar techniques, but you can also sit in with members of Tower Of Power, playing four fan favorites and for new grooves created just for you. Level: From Beginner to Advanced. It’s a deceptively tricky and intricate playing style, and this book by TOP’s own Jeff Tamelier is a great resource for understanding and gaining tips on what he (and other TOP players) did with the music, and how they tackle it. The tabs and songs are only part of why this book is helpful. If you are an actual PLAYER, and understand how actual musicians converse and are looking for any insight into funk guitar and Tower Of Power, this is an excellent book. Bass guitar players may see another great book: Sittin’ In With Rocco Prestia of Tower of Power. Download Learn Funk Guitar with Tower Of Power’s Jeff Tamelier PDF free and other books from our site. Only high quality PDF scans. Please write a review, it's important for our community. The great stuff for every aspiring funkster!